At Friends of the Rappahannock, we like to say that restoring a watershed is like cleaning a car. To do it right, you have to start at the top and work your way down. At the top of our watershed is the “headwaters” of the Rappahannock river system, which starts in the Blue Ridge Mountains. Cool, clean water springs from the mountain slopes of Shenandoah National Park, creating pristine environments that support sensitive native species like brook trout. Unfortunately, as soon as these mountain streams exit the protected forests of the National Park, they often lose their tree canopy and begin to accumulate pollutants like nutrients, sediment, and bacteria that run off of neighboring residential and agricultural lands. Once in the water, these pollutants are difficult to remove and can have devastating effects all the way downstream to the Chesapeake Bay. 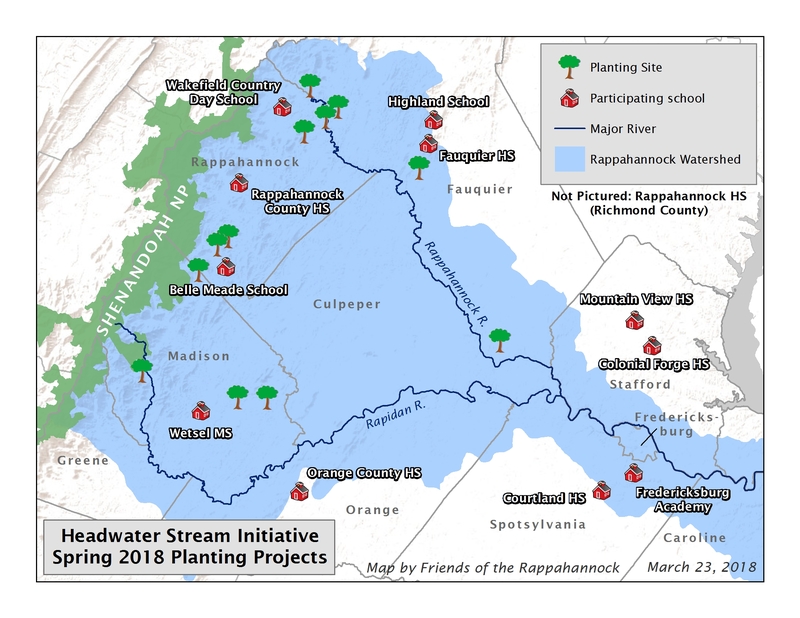 The Headwaters Stream Initiative is a partnership dedicated to restoring forest canopy that will keep those streams clean from Chester Gap in the Blue Ridge Mountains all the way to Sting Ray Point at the Chesapeake Bay. Through this program, we work with Warrenton-based Piedmont Environmental Council, local Soil and Water Conservation Districts, the Virginia Department of Forestry, and a wide range of community groups to plant riparian stream buffers on private lands along the Rappahannock’s upper tributaries. Stream buffers are protective strips of forests around bodies of water. They work like sponges, absorbing runoff and filtering contaminants before they reach the water. They also provide valuable habitat for all kinds of fish and wildlife. 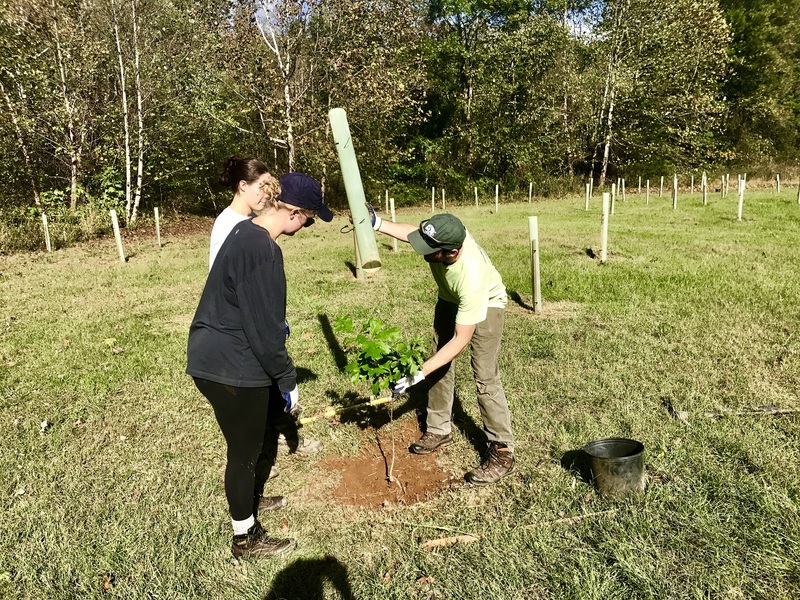 In spring 2018, we’re using several grants from the National Fish and Wildlife Foundation, Virginia Department of Forestry, Northern Piedmont Community Foundation, and Chesapeake Bay Trust to help us plant 25 acres of new riparian forest across four counties of the upper Rappahannock watershed. Our goal is to enlist over 300 volunteers to plant 3,000 trees at twelve different sites. That’s a lot of new forest! Best of all, we get to train the next generation of river stewards along the way. Over 200 of our volunteer planters will be middle and high school students from across the watershed as a part of our Student Stream Team. These young people are chomping at the bit to get outside and make a difference in their home watershed, and we’re thrilled to help them do that. Check out the map to see where we’re working this spring. If you want to get your hands dirty and your feet wet, we’d love to have you as a Headwaters Stream Initiative volunteer. We are currently accepting registration for a number of volunteer events this spring. Please visit our events page for more information on how to register to volunteer with us.